Feedback: 18 comments - leave yours! Paul Bocuse is France's number one celebrity chef. In a way he is the incarnation of the French chef on the numerous TV shows where he appears. He commands immense respect across the nation and amongst professional cooks. He has a number of restaurants, food product lines and books. I assumed that his flagship restaurant outside Lyon would be a top gastronomic restaurant - how naive. L'Auberge du pont de Collonges in Collonges au Mont d'Or near Lyon is where Bocuse is. That is his most famous restaurant. If you want to see him, that is where you need to go. 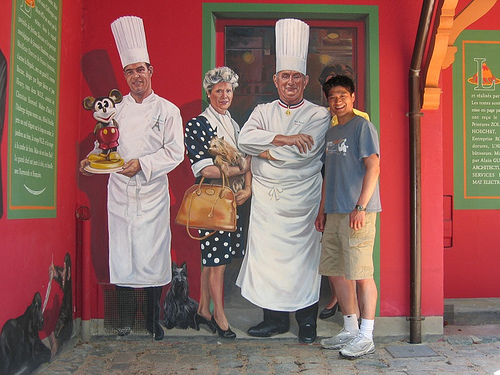 Arriving at the restaurant, the first thing you notice is the immense mural painting of Bocuse with a number of other chefs. Another mural shows him with a TV crew. The murals seem to be a hit with Chinese tourists as you can see on the picture above. The first thing after the no less immense parking space for the huge tourist buses built on his land. As you walk towards the restaurant, Bocuse is right outside, shaking hands with clients and posing for pictures dressed up as a chef. I say dressed up because obviously he doesn't see the inside of the kitchen. He didn't move for the entire meal, so I guess his job nowadays is to clown around with clients and enjoy his celebrity. This does not seem to disturb the usual patrons. We saw several tables where a man was filming the entire meal for his grandchildren. That Bocuse does not cook himself at all, even when he is present in his restaurant, is not a scoop. 'Mr Bocuse, who cooks when you are not here? - The same people who cook when I am here'. Straight from the horse's mouth. In a 3 Michelin stars restaurant, the chef usually does not cook, but he looks at every single plate going out the kitchen. Bocuse is not even in the kitchen. The waiter was so pretentious and full of himself, I assume must have been working for the train station Mac Donald's the week before. He seemed so elated to be working for Bocuse he barely noticed the poor quality of the food or the clients. We tried the soupe de truffes en croûte, "Created in 1975 for President Valéry Giscard d'Estaing at the French Presidential Palace", a watered down broth with some black rubbery pieces which only the price indicated they were truffles. I've been trying to forget the rest of the meal for some time now. There was nothing redeeming in it. The cheese tray was the icing on the cake. 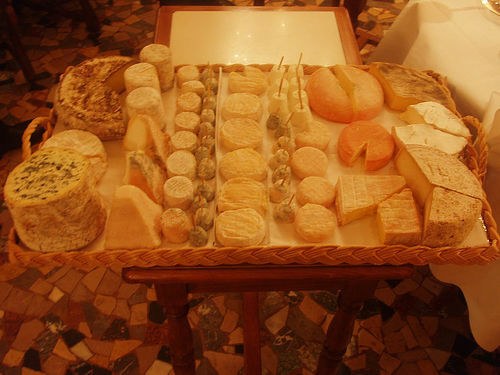 In French gastronomic restaurants you expect to get a good selection of local and national cheeses served at the perfect degree of maturity. Here the tray was a wooden thing straight out of the fridge. There was even condensation on the wood and I touched it and the cheeses, both about 5°C. I've never seen this in any restaurant, let alone such a 'legendary' place. Back home I hit the books, puzzled. The Michelin guide gave it 3 stars, but Gault Millau, a leading French restaurant guidebook, chose not to give him any rating, explaining that if they did it would be a mere 13 or 14 on a scale of 20. Restaurants below 12 don't even make it in the guide. In the last edition Gault Millau says the restaurant is a gastronomic museum where you can experience the way people dined in the 1970's. Well, I sure hope they dined better back then. Bocuse clearly hopes to go down in history like the most important French cook of the 20th century, like Carême and Escoffier before him. I am not sure about that. The term 'chef of the century' was bestowed on him by none other than Gault Millau in 1989. But Gault Millau giveth and the Gault Millau taketh away. When in 1999 the guidebook ventured to say how bad Bocuse's restaurant had become, all hell broke loose from Collonge. Bocuse said that 'The nice thing with this restaurant guide is you can use in the toilets. You see, pages are easily removed.' or 'Anyway, Mr Henry Gault is always drunk.'. You don't need to take my word for it. This article in French in a local Lyon paper gives more details. When chef Bernard Loiseau shot himself after losing two points on the Gault Millau scale, the first to speak against the restaurant guides' dictature was - Bocuse. There he was, his belly almost pushing the TV cameras back, having hissy fits that restaurant guides were too hard and did not know one thing about gastronomy. Well, I don't know about that, but from that day I have stuck to the Gault Millau and I try to read between the lines before booking. It was really a sorry sight to see such a stand-up man clowning around dressed up like a chef before his restaurant almost like an old dog begging passers-by to be pet him. He deserves better than that. I hope to have seen him on one of his bad days. But is it fair for Bocuse to rest on a 20-year-old reputation and let his restaurant slide down, hoping nobody will notice and going after the few courageous food critics who reported fairly how bad it is? There is nothing wrong with a chef being over the hill. At one time or another, you need to retire, or you'll either die from exhaustion or the restaurant's quality will decline. Bocuse has apparently managed the latter without having to pay the price of being downgraded by Michelin. Good for him, not so good for the pigeons like myself who go there expecting a 3-Michelin-star-class dining experience. And only the quality has been discounted, not the price. And you could expect that a man managing such a feat would be try to keep it quiet lest somebody notices. Not quite. Bocuse actively poses as the 'Pope of French gastronomy'. Have a look at his worldwide cooking competition where the prize is a golden statue of Paul Bocuse in chef's attire with both feet on a tiny terrestrial globe. 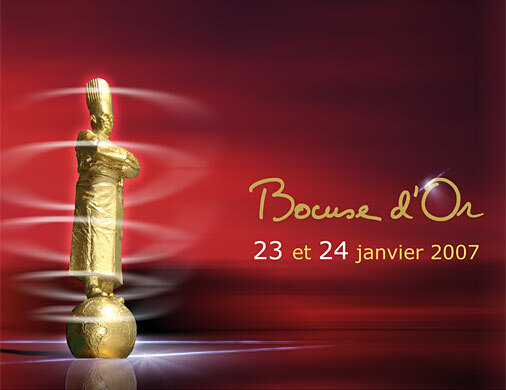 It is modestly called 'Le Bocuse d'or' - the golden bocuse and presented as the Nobel Prize of French gastronomy. I'm quite sure Bocuse can cook to a very high order when he wants to, that he is a capable man always eager to help younger colleagues' careers and that perhaps he was instrumental in creating today's French cuisine. Many great chefs are egomaniacs and it may come with the territory. But the man and the restaurant I saw that day was little more than a tourist trap capitalizing on media hype. Why newspapers are afraid of printing how far his restaurant has really sunk from the 3 Michelin stars he obtained in1965? So you will need to excuse me but after having been separated from the best part of €500 for a very bad meal and seeing the man parading around the world like if he was Antonin Carême reincarnated, I felt I owed readers of FXcuisine.com the truth. And the French reader need not feel insulted, for I am a great lover of French gastronomy and his national gastronomic pride would be placed in the wrong place if he were to feel I am challenging French gastronomy by saying that the chef is naked. This phenomena is endemic today. Tour d'argent is a sad tourist attraction rather than what is used to be. As to Bernard Loiseau, every person interested in haute cuisine ought to read the inspiring "The Perfectionist" by Rudolph Cheminisky, Peguin 2005 a detailed analysis of the star system which drives the great chefs to giving their lives for the quest of stars and gold. Eric, bonjour et merci pour ton commentaire! C'est difficile de dire la vérité sans blesser les sentiments des Français qui n'ont jamais mangé chez Bocuse et croient ce qu'ils en lisent. C'est bien dommage alors que tant de jeunes chefs font un travail infiniment supérieur. Mais bon, Bocuse soutient toujours ses jeunes collègues et tant qu'on le flatte c'est un gars plutôt sympathique. My wife and i ate at paul bocuse in 1995 for our 40th wedding anniversery. we had the finest meal that we have ever eaten,the great man was in the kitchen overseeing the food. they prepared a miniature cake for us and brought out a hurdy gurdy to play us a song. just after our visit Jonathon Meades (Times Rest.Critic). also visited gave it 10 out of 10 and eulogised about it. We have the menu of '95 and our photo with the great man. you left it too late to see him at his best. Peter, I am glad to hear from somebody who saw Bocuse when indeed he was still a great man. Now he is still a great guy, no doubt, but if you want a really memorable meal you might want to check some of his competitors. thank you for this eye-opener. i'm sad for paul bocuse because he seems to be in denial about the reality of his restaurant's declining quality. really sad that some people can think that it's OK to rest on their laurels once they've got them. and i'm sad for you, too, for shelling out that amount for a meal that (pardon the pun) left a bad taste in your mouth. Michael, thanks for your visit! I don't feel that bad, now that I was able to share my experience with other people, at least that helped somebody. Bocuse is acutely aware of the state of his restaurant but all he cares about is that people talk about him. It's a bit sad, he is very nice and humane for an egomaniac, many better chefs are much less of a person than he is. But for serious food, move on to another place! ....sigh... We had the almost exact same experience at Tavern on the Green in NYC... 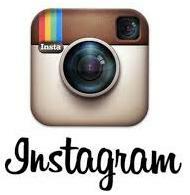 It is a pure tourist trap. We attended a wedding there. Food? Awful...inedible. Bathroom so ghastly aromatic I opted to wait til I got home. Service? frightening. It appears the daughter of the former owner now runs the place after he died. It's just shameful. FX's answer→ JMZ have fun with the butternut squash soup! Said but true. Michelin is very slow to respond to the changes. I have been on the receiving end of that phenomena a few times myself. FX's answer→ Leonid, I think in the specific case of Bocuse they had 15 years to downgrade his rating. I saw a documentary on him and every year he is very worried about the new edition - for good reason. This is so true. I think Mr Bocuse has become such a driven businessman/celebrity who has perhaps forgotten joy of cooking & eating. His global outposts (Tokyo & Melbourne - although lasted only a few years) were somewhat the similar state when I tried. FX's answer→ Mami, I don't think visiting another of Mr Bocuse's restaurants is on the menu for me! FX's answer→ Yes indeed, but the power of propaganda is such that very few people in France would dare say that this is not a very good restaurant. Bonjour, un article vraiment bon. Il semble correct de parler de votre expérience ici, mais la crédibilité étonnante mauvaise du guide Michelin. Salutations de l'Espagne. I ate at other 3 star restaurants, and maybe this one is not on the same level for dressing plates or flavor associations, but it's one of the most touching ones, with great classics extremely well made. FX's answer→ I am very pleased to hear that you were pleased with the meal - that is the most important, after all.